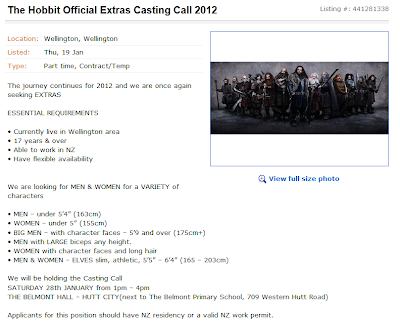 Despite the fact a very few of my readers are actually in New Zealand, if you just happen to be then tomorrow there is an open casting call to star as as extra in the Hobbit films. I will definitely being trying my luck tomorrow with what I can only imagine with be thousands of others. Actually I do have some experience as an actor, ranging from those school plays that everyone is in to actually being an extra for a few New Zealand made television series. There was actually a casting director that was always around my old highschool, who was looking for people to star in "The Tribe" series, which I heard was popular overseas but I never watched it myself. Anyway maybe if fortune smiles on me I can have my visage on screen in the Hobbit for a few seconds, wish me luck! I remember The Tribe. I never really watched it but damn that was a long time ago. Anyway good luck! I'd literally die to get the elven role in THE HOBBIT! I would love to be an extra! This is the second time some one mentioned the TV show the Tribe! I gotta check that show out! Is that Hagrid in the middle? I"m so jealous. D: Good luck though! That would be grand. If I was anywhere near there I'd do it. I'm small enough that I'd fit the part. Good luck. Let us know if you get a part! this can only mean more lord of the rings or the hobbit! omg i cant wait! OMG!!!! What happened?!!? Are you in?? Are you now officially a Hobbit!?!?! OMG!!! Wow! Wishing you the best of luck. Let us know how it goes. If you get it you better be posting pictures so we can see all that's happening behind the scenes. This really makes me wish I lived in New Zealand. Shall have to send my cousins in my place... I hope you get to be a hobbit!! The Tribe was one of my fav tv shows when I was in high school. :D It came on one of the weird random extra channels we had when we still paid for satellite.